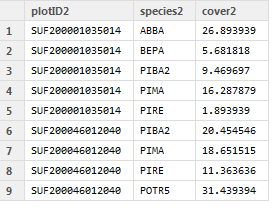 I have a dataframe that contains a plot ID (plotID), tree species code (species), and a cover value (cover). You can see there are multiple records of tree species within one of the plots. 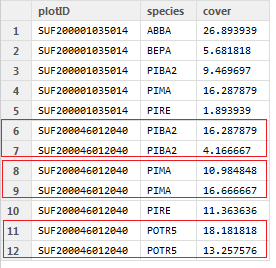 How can I sum the "cover" field if there are duplicate "species" rows within each plot? You can do this in a number of ways. Using base-r, dplyr and data.table would be the most typical. Not the answer you're looking for? Browse other questions tagged r sum dataframe summary multiple-conditions or ask your own question.